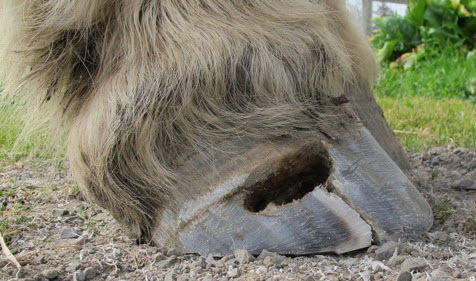 A keratoma is a rare condition that can develop in a horse’s hoof. It’s a benign tumor made of keratin, a fibrous protein, that grows on the coffin bone. Although uncommon, a keratoma can lead to lameness, and sometimes, it may require surgery to remove the tumor if it becomes too big. If this happens, horses may need extra hoof support and comfort during the healing process, because it can be lengthy and painful. Removing a tumor creates a difficult recovery process, especially in the hooves because they support a horse’s entire body weight. After a horse has keratoma surgery, there’s a hole-like wound in the hoof wall where the tumor used to be. It is extremely important for hoof care professionals to avoid trying to repair the missing hoof wall by pouring or packing material directly in the hole, because it can cause infection. This area needs to stay in an anaerobic environment, or absent of free oxygen, in order for the hoof wall to grow back. That being said, the hole in the hoof wall causes the coffin bone to hang unsupported when the horse is standing, so horses need something to hold the hoof together. Applying a heart bar shoe helps provide extra support while keeping the hoof in an anaerobic environment so that the coffin bone can heal properly. This technique applies pressure to the frog and helps push and hold the coffin bone back into its proper position. After hoof care professionals apply a heart bar shoe, the affected area from the surgery begins to heal and there is no longer high risk for infection, pour-in pad materials can then help to stabilize other parts of the coffin bone and provide the cushion a hoof needs to grow back properly. It is important to continue applying the material until the hoof wall fully grows back. Depending on how much of the hoof wall was removed during surgery, this can take anywhere from six months to a year, or possibly even longer to heal. The type of pour-in pad hoof care professionals should use depends on the environment a horse lives in. For horses spending most of their time on harder, drier grounds like gravel, rocks or even packed dirt, Sole Guard from Vettec serves as a firmer, durable pad material that distributes a horse’s weight evenly across the entire hoof-bottom. This will help the hanging coffin bone to slowly push back into place. Because this material acts as a “fake sole” while elevating the hoof off the ground, it also allows for faster sole growth. For a horse that needs pressure relief, Sole Guard provides comfort and support. For horses on softer, wetter grounds like grass or mud, Equi-Pak CS from Vettec is a supportive material that keeps pressure off the hoof wall and strengthens the hoof. It is made with copper sulfate, which helps deflect and retain moisture, and therefore protects the hoof from infections. The hooves support a horse’s whole body, so it’s important for horse owners to provide the proper care for their horses when they recover from any kind of hoof surgery. Talk with a farrier or veterinarian about how to comfort horses after removing a keratoma tumor, and how pour-in pad materials can be a helpful tool for extra support.